I'm going to review the Fiber Mask Set by BioRepublic that I had gotten in my June Glam Bag from IPSY that I did an unbagging post on. For a review of the 'Cucumber Breeze' and Pomegranate Crush' Fiber Masks, then read this article. 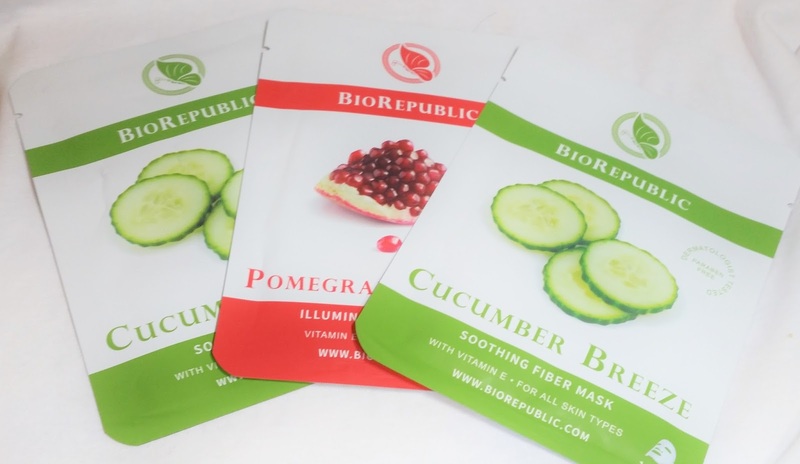 I'm going to review the Fiber Mask Set by BioRepublic that I had gotten in my June Glam Bag from IPSY that I did an unbagging post on (which you can check out at the link). If you read that post, then you know that I had not gotten around to using them around the time of that post and decided to make a separate review for them. BioRepublic is a skincare company that takes the best of Korean skincare and combines with high-quality American ingredients. Everyone that got their masks from IPSY had gotten two masks: the Cucumber Breeze and the Pomegranate Crush. I had actually redeemed some of my IPSY points and got a second Cucumber Breeze Mask, so I got three masks in total. These are dermatologist tested, paraben free, and these masks are also biodegradable. For anyone not familiar with these types of masks, it's an actual mask made of fiber that comes folded up in a packet with the mask already soaked in a facial serum. You are supposed to apply this to clean skin, leave on for 15 to 20 minutes, then take off the mask and lightly tap any excess product into the skin. For best results, you should use this 2 to 3 times a week. Now, the Pomegranate Crush mask is an illuminating mask. It comes infused with natural pomegranate extract and vitamin E, which helps fade acne scars when used in moderation. It's supposed to brighten and even out complexion for radiant skin. I really like anything that brightens because brightening typically means whitening. Why is that? It's because there are certain products or ingredients that their intended use is for skin whitening and are classified as such by the FDA. There are other products that do have whitening capabilities, but if they're not approved for that purpose then you can't legally market it as a skin whitening product, so the term 'brightening' will often be used. I personally love using skin whiteners to help with my facial scarring, plus I like to look really pale. When the mask was applied, it was pretty drenched and even after the 20 minutes were up, it was still pretty wet. It felt cool and refreshing when worn, but I didn't notice too much of a difference in my skin when it came off. I did see some luminosity to my skin and felt a little bit of tightening around my jaw, which could either be from the mask or because my face was drying down. However, to really see if there are any big changes in skin and complexion, you would need to use these regularly. The Cucumber Breeze is a soothing mask and comes infused with natural cucumber extract as well as vitamin E. This is supposed to soothe stressed skin, tighten pores (I need that), and reduce the appearance of fine lines for rejuvenated, spring-fresh skin. I really love the smell of it. I tend to be really sensitive to smells in beauty products, but cucumber is one of the very few scents that I can tolerate being so close to or on my skin. When I say sensitive, I mean my body will react to it before I can consciously detect the scent in the air and perfumes will often elicit the worst reaction, so you will probably never see me review one. After the mask came off, I saw that it did alleviate quite a bit of my redness. I can't say much about the reduction of fine lines because I'm only nineteen, but I did feel some tightening in my cheek area where I do have enlarged pores and left my face feeling refreshed and smooth. Out of the two, the Cucumber Breeze is my favorite of the two types, so I'll definitely be using that second one. After one use, the Pomegranate Crush doesn't really do much for me, which I noticed that a lot of people felt the same way in the IPSY product reviews. A lot of them loved the Cucumber Breeze but were just not feeling the Pomegranate Crush.